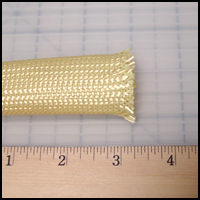 Aramid Fiber - Braided Sleeves - CST The Composites Store, Inc.
Aramid yarn braided to form a sleeve or tube. Braided sleeve is very difficult to measure due to the extreme flexibility of the product. Therefore, we weigh product based upon estimated yield at ±45°; fiber orientation. Technical information is provided by the manufacturer and is believed to be accurate although not guaranteed and is subject to change without notice. 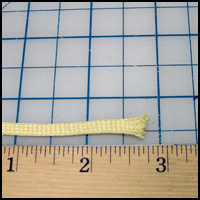 NEW ARAMID BRAIDED SLEEVES - 0.236" Dia. Aramid Braided Sleeves, 0.236" Dia., 1-9 ft.
Price per foot, Minimum quantity 1 ft.
Aramid Braided Sleeves, 0.236" Dia., 10-24 ft.
Price per foot, Minimum quantity 10 ft.
Aramid Braided Sleeves, 0.236" Dia., 25+ ft.
Price per foot, Minimum quantity 25 ft.
ARAMID BRAIDED SLEEVES - 0.25" Dia. Aramid Braided Sleeves, 0.25" Dia., 1-9 ft.
Aramid Braided Sleeves, 0.25" Dia., 10-24 ft.
Aramid Braided Sleeves, 0.25" Dia., 25+ ft.
Aramid Braided Sleeves, 0.25" dia., Volume Pricing - 1+ lbs. Price per pound, Minimum quantity 1 lb. 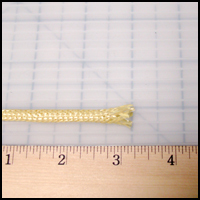 ARAMID BRAIDED SLEEVES - 0.75" Dia. Aramid Braided Sleeves, 0.75" Dia., 1-9 ft.
Aramid Braided Sleeves, 0.75" Dia., 10-24 ft.
Aramid Braided Sleeves, 0.75" Dia., 25+ ft.
Aramid Braided Sleeves, 0.75" dia., Volume Pricing - 1+ lbs. 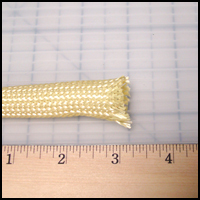 ARAMID BRAIDED SLEEVES - 1.0" Dia. Aramid Braided Sleeves, 1.0" Dia., 1-9 ft.
Aramid Braided Sleeves, 1.0" Dia., 10-24 ft.
Aramid Braided Sleeves, 1.0" Dia., 25+ ft.
Aramid Braided Sleeves, 1.0" Dia., Volume Pricing - 2+ lbs. Price per pound, Minimum quantity 2 lbs.